In 1938 a Sicilian mayor did the local homosexuals an inadvertent favor, and all in the name of currying favor with Mussolini. Anxious to appear as fascist as possible, the mayor of Catania noted the "spreading of degeneration" caused by local gay dances and gay behavior at some of Sicily's gorgeous beaches and rounded up 45 guys from Catania and shipped them, handcuffed to leaky boats, 300 miles away, to the lovely island of San Domino in the Adriatic Sea. So far, so fascist, but as the months passed on San Domino, the men -- far away from the prying curiosities of their devoutly Catholic family members, their employers and the police who kept watch on everything that moved in their hometowns -- enjoyed something approximating a paradise. This year a delegation of Italian gay and lesbian activists traveled to the island to pay tribute to the wartime internal exiles. 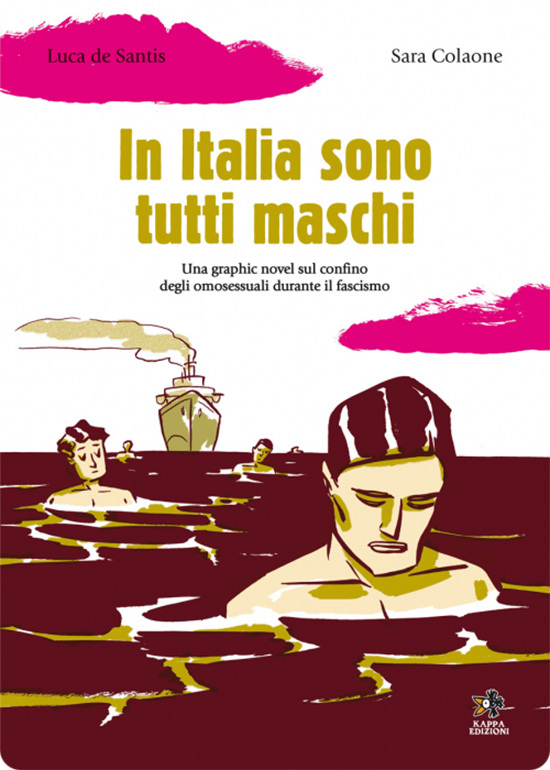 And a graphic novel called In Italia Sono Tutti Maschi (In Italy Everyone Is Manly) was published in 2008. "We notice that many public dances, beaches and places in the mountains receive many of these sick men, and that youngsters from all social classes look for their company," the mayor of Catania wrote in 1938. He went on (and on) about "a sexual aberration that offends morality and that is disastrous to public health and the improvement of the race." Finally, he declared that "this evil needs to be attacked and burned at its core." No members of the penal colony are believed to be alive today. A book by researchers Gianfranco Goretti and Tommaso Giartosi, The Island and the City, details the verbal histories of some of the prisoners as well as those of several San Dominions, who remember the period when dozens of men, most of them gay Catanians, were interned on their island. We were curious because they were called "the girls." We would go and watch them get off the boat ... all dressed up in the summer with white pants -- with hats. And we would watch in awe -- "Look at that one, how she moves!" But we had no contact with them. They would be locked inside the dormitories, and they were under the supervision of the police. My father always spoke well of them. He never had anything bad to say about them -- and he was the local Fascist representative. In those days if you were a femmenella [obviously gay] you couldn't even leave your home, or make yourself noticed -- the police would arrest you. On the island, on the other hand, we would celebrate our Saint's days or the arrival of someone new. We did theatre, and we could dress as women there and no-one would say anything. Giuseppe said that the outbreak of World War II in 1939 ended the internal exile program, and the men were returned to their home towns, where they lived under house arrest. According to Giuseppe, many wept when told they would have to leave San Domino and the lovers and friends that most had found there. This blog post originally appeared in a slightly different form at Nightcharm.com (link NSFW). In Italia Sono Tutti Maschi is available on Amazon. Check out a preview of the graphic novel here (in Italian).